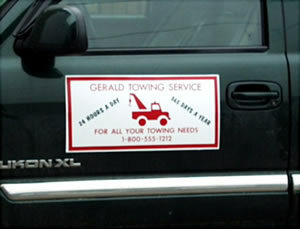 Looking for an inexpensive magnetic sign to affix to your car or truck? This product will not mar your vehicle and will hold securely until you're ready to remove it. Great for temporary identification purposes by real estate agents and parade organizers/partipants, they're reusable and will give years of good service. Total Personalization - Bilingual too! We can do simple logos and can cut the sign to your size specifications. We can also do bilingual signs. Don't lose important recognition in your community: get these inexpensive and easily removable signs for all of your vehicles. We'll have some more photos here soon.